Though a southsider himself, Fr Hendry has spent most of his life as a priest in Glasgow's north side. 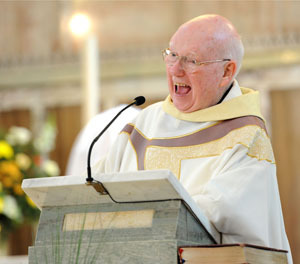 He was ordained in 1966 and appointed to the then-new parish of St Gregory's in Maryhill. From there, he went to Glasgow University as Chaplain, then spent a few years in Sacred Heart Cumbernauld before his appointment as parish priest of St Teresa;s here in Possilpark. To date, he has been here 26 years! He celebrated his Golden Jubilee as a priest on the 26th of June 2016. He enjoys being here and says he is not thinking about retirement yet - much to the delight of his parishoners! As a rule, baptisms take place on a Sunday, either during the Mass or at 12 noon. Please contact Fr Hendry to make an appointment. Marriages are by arrangement with Fr Hendry. Please phone him or speak to him to make an initial appointment. When there has been a death in the family, it would be very helpful if one of the family would contact Fr Hendry as soon as possible, so that a date can be agreed with the parish and with the undertaker. Funeral Services at the Crematorium are by arrangement. First Communion for our two schools (St Teresa’s and St Cuthbert’s) take place in May of each year. Once dates have been agreed with the parish, detailed arrangements are made by each school. By September 1932, Fr. John Conlan had moved into 177 Saracen Street, as parish priest, and said his fist Mass there on the feast of St. Therese of Lisieux. By December, the temporary church on this site was ready and by 1934 the new parish house on the hill was also ready for Fr. Conlan and his curates: Fathers McGrory, Magauran and Murphy. Throughout the war years, the “temporary church” served the parish well, but the community never lost sight of the land still waiting for a permanent building. Eventually, on the 8” December 1960, their dream was realised and the new Church of St. Teresa was solemnly opened by Archbishop Campbell. Designed by Alexander McAnally with accommodation for 1,000 the church was a triumph of its time. Artistically and architecturally it won great renown, for apart from the structural beauty of the building, it has some magniﬁcent examples of stained glass, wrought-iron and marble. The statues at the two side altars, the stations of the cross, and the smaller statues that surmount the doorway are all Oberammergau carvings. The life-size cruciﬁx over the main altar was carved by James McAnally, here in Glasgow. Both the church and the parish house are listed buildings, and that caused some difficulty for the parish when vandals burned down the temporary church that had long served it as a spacious and well-used hall. The damage was such that the hall had to be demolished and with insufﬁcient funds to replace it, the architects Paige & Park devised an award-winning small hall within the church itself, making use of the surplus oak benches to form wall panels. This has allowed the parish to retain a very sizeable church, a small hall, and a spacious gathering area, all within the conﬁnes of the original church. It was not long before other churches came to see the usefulness of such an innovative architectural design and to implement it in church buildings that had become too large for their congregations. More recently, the land on which the original church stood was sold to the Franciscan Sisters and their Convent now stands on that site. Another piece of land was sold to Carrick Homes, and Craigbank Care Home, a 62-bedded care provision, has been built there. A ﬁirther piece of land sold for development purposes now has 24 ﬂats on it. The money raised from the sale of this land has enabled the parish to undertake major repairs and renovations in the Church itself. The closure of the parish of Our Lady of the Assumption in Ruchill widened the boundaries of St. Teresa’s parish, which now cares for two primary schools [St. Teresa’s & St. Cuthbert’s] three sheltered housing complexes [at Barloch Street, Gourlay Street and Hawthorn Street] and the Nursing/Care Homes at Allander Court, Four Hills, and Craigbank Care Home.